You probably have heard the story of a farmer who had a special goose. Each day this creature laid a beautiful, glittering golden egg. The farmer was delighted and took the eggs to market. And soon he got wealthy and rich. But it was not long before he got impatient with the goose, because she only gave him a single golden egg a day. He felt he wasn’t getting rich fast enough. Then, one day, the farmer got the idea that he could cut open the goose to get all the gold out at once. But when the deed was done, he ended up with a dead goose and no more golden eggs at all. What is the morale of this story? Why am I sharing this fairytale with you, Marketing Superhero? There is indeed a morale. Because you are the goose! You are laying your own golden eggs every single day. And the question is how are you treating this wonderful creature? Are you pushing yourself so hard to squeeze out more golden eggs? Very often we are doing exactly that. We can be quite harsh on ourselves. Pushing ourself to the limits. So be honest here: are you taking really, really, really good care of yourself? You might think this is slightly off topic. But every Marketing Superhero needs to train. Needs to work-out. Either by going for a run, attending a yoga class or doing some fitness. It helps you to get rid of those nasty stress hormones in your body. Do whatever feels good for you. Just get that heartbeat up a little. So you need to breathe in a bit more deeply. This way you burn up the adrenaline and cortisol. Which is beneficial for both your body and your mind. Do the type of exercise you like best. Play tennis, go to the gym or take ballet lessons. But one of the simplest ways is taking a 15 minute walk once or twice a day. Preferably in nature. So you can breathe in fresh oxygen. It also helps you think more clearly. So why not take a short walk in your lunch break or after work? Step out of the subway a few stops earlier and walk the last mile home. When you take good care of yourself, you can approach your tasks so much better. You are much more creative. You are literally more flexible. So be sure to take care of that goose. 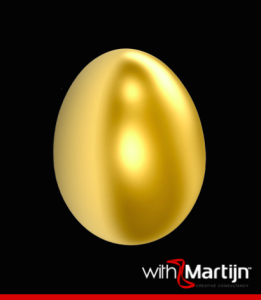 Remember you are the one laying your own golden eggs. Please be patient with yourself (and pace yourself). Don’t be too hard on yourself. Don’t stress yourself out! So go for a walk. Go for a 15 minutes walk around the block now! So true! Elke dag is en maakt een verhaal. Door je oogharen kijken, afstand nemen, een wandelingtje of dutje doen of collega of een klant vragen mee te kijken…. Thank you! Make wonderful stories every day!